Sinharaja Ecolodge Sri Lanka The Rainforest Ecolodge, Deniyaya has been designed to preserve and provide a sensational experience of the forest habitat in all its glory. The symbiotically blended forest environs to comfort and privacy tendering the best possible commune with nature. Environmentally-friendly alfresco room, observation deck, lounge and meeting room form key components within each unit. Guests can also enjoy the spellbinding view from any part of the lodge. 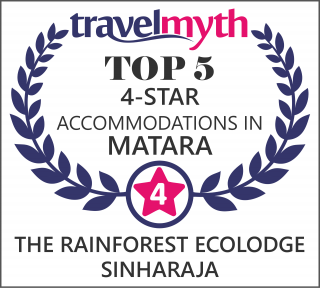 The Rainforest Ecolodge thrives on a five hundred-acre division of the Enselwatte Tea Estate bordering the South-eastern side of the Sinharaja Rainforest, with forest reserve. The colourful, breathtaking opera of endangered ‘local culture’ can now play everyday to the concert perch of the open viewing deck.